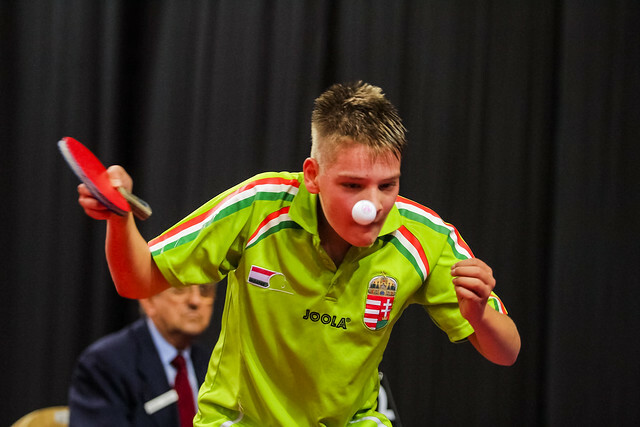 Impressive performances, Hungary and Russian won the respective Cadet Boys’ Team and Cadet Girls’ Team titles at the 2017 Hungarian Junior and Cadet Open in Szombathely on Saturday 11th November. In the former, Csaba Andras and Oliver Both emerged successful, as in the latter did the partnership at Arina Slautina and Natalia Malinina. A three-one penultimate round win against the French duo of Fabio Rakatoarimanana and Myshall Sabhi secured the Hungarians a place in the final where they endured a more testing engagement. They were stretched the full five match distance by the combination formed by Ireland’s Owen Cathcart and Norway’s Borgar Haug. Mainstay of the victory was Csaba Andras. He beat both Owen Cathcart (10-12, 13-11, 3-11, 11-7, 11-9) and Borgar Haug (11-6, 9-11, 11-6, 11-6), the win against Borgar Haug being vital after the Hungarians had lost the doubles wen (8-11, 8-11, 12-10, 11-4, 11-8). Hero of the hour was Oliver Both. In the concluding match of the fixture, he overcame Owen Cathcart (13-11, 11-9, 11-5). In the counterpart semi-final Owen Cathcart and Borgar Haug had recorded a close three-two success against Italy’s Simone Sofia and Andrea Puppo. A closely contested Cadet Boys’ Team final; it was the same in the Cadet Girls’ Team final; Arina Slautina and Natalia Malinina beat Chinese Taipei’s Chien Tung-Chuan and Huang Yu-Jie by three matches to two. The player to cause the Russians problems was Chien Tung-Chuan (11-8, 13-11, 11-4); she beat both Natalia Malinina (11-8, 13-11, 11-4) and Arina Slautina (11-7, 11-4, 11-7). However, defeat for Huang Yu-Jie by the narrowest of margins against Arina Slautina in the opening match of the fixture (9-11, 8-11, 11-7, 11-3, 11-9) and in opposition to Maria Malinina in the concluding match of the engagement (11-9, 4-11, 11-9, 11-9), after the Russians had won the doubles (12-14 , 7-11, 12-10, 11- 7, 11-9), cost Chinese Taipei dearly. Earlier in the day Natalia Malinina and Arina Slautina had recorded a three-nil semi-final success against Lithuania’s Emilija Riliskyte and Konelija Riliskyte; at the same stage by the same margin Chien Tung-Chuan and Huang Yu-Jie had ended the hopes of the French outfit formed by Prithika Pavade, Lou Frete and Chloe Chomis.